Today's New York Times carries a review of a film called "Hot House" that goes inside Israeli prisons and examines the lives of Palestinian prisoners. We're not recommending the film or the review. But we do want to share our feelings with you about the beaming female face that adorns the article. You can see it here. The film is produced by HBO. So it's presumably HBO's publicity department that was responsible for creating and distributing a glamor-style photograph of a smiling, contented-looking young woman in her twenties to promote the movie. That female is our child's murderer. 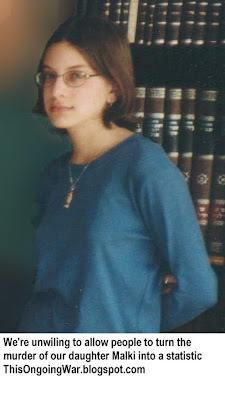 She was sentenced to sixteen life sentences or 320 years which she is serving in an Israeli jail. Fifteen people were killed and more than a hundred maimed and injured by the actions of this attractive person and her associates. The background is here. Neither the New York Times nor HBO are likely to give even a moment's attention to the victims of the barbarians who destroyed the Sbarro restaurant in Jerusalem and the lives of so many victims. So we would be grateful if you would pass along this link to some pictures of our daughter whose name was Malki. She was unable to reach her twenties - Hamas saw to that. 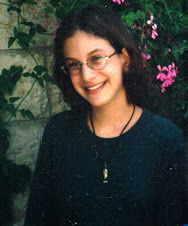 Though she was only fifteen years old when her life was stolen from her and from us, we think Malki was a beautiful young woman, living a beautiful life. We ask your help so that other people - far fewer than the number who will see the New York Times, of course - can know about her. Please ask your friends to look at the pictures - some of the very few we have - of our murdered daughter. Well, look at the bright side at least your daughter isn't going to grow up to be a hated filled bigot like you two. I concur with the anon poster above. You two cowardly anonymous posters are so blinded by your own hatred that you can't see the difference between bigotry and pain, or the murderers and the murdered. I almost pity your poor twisted souls. My fervent wish is that you never reproduce. When two raging antisemites accuse others of bigotry one has to scratch one's head in disbelief. Regardless of your politics, I find it staggering that some posters can't find it in themselves to deplore the murder of innocent children, regardless of religion.